I guide a women's healing circle which we have lovingly started calling our Soulful Sunday group. In this class we explore creating greater peace and happiness through yoga, meditation, energy medicine, tapping, focusing, mindfulness, journaling, story telling, art/play therapy and more. I love mandalas (you may have noticed) and I had always wanted to make a nature mandala, but had not gotten around to do it. 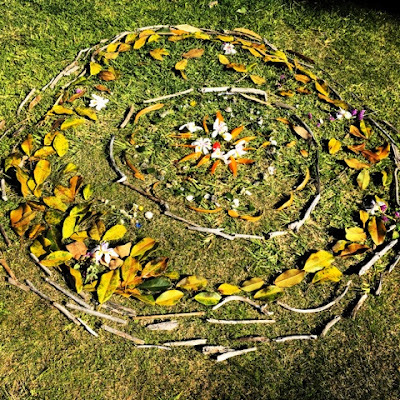 On recent Soulful Sunday meetings we decided to meet outdoors and it occurred to me that it would be a great opportunity to finally take a shot at a nature mandala. We headed towards a park near the beach and created this beautiful nature mandala that is shown in the picture above. The whole process was relaxing, fun, energizing and creative. Without speaking much after the initial instructions, we were able to have personal reflective time while walking and looking for objects and silently bonding when creating the mandala together. The whole process felt very harmonious to me and brought me much peace. Each of the members of the group reported having similar experiences. - You are in nature, which is relaxing in itself. - When you are done... you let it go. This is fun and relaxing activity and I can't wait to do one with my family. Next time you are in nature, whether you are alone or accompanied, try it! I think you'll find the whole process uplifting. I have practiced meditation for many years now, and can say without a shadow of a doubt that it has been one of the practices that has both helped me love and accept myself the most. This is why it has been important for me to share meditation with my loved ones. 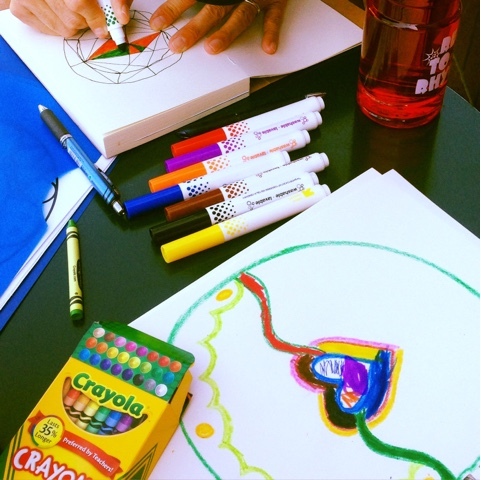 There are many ways to meditate but coloring has proven to be one of the easiest ways to meditate. I have given mandala coloring books, colored pencils and crayons to adults and children as presents for Christmas and birthdays. Most of them report back that sitting down to color has been very calming. Nowadays you can easily find many meditation coloring books in places like Barnes & Noble, Amazon, Target or Michael's. One of my favorite ways to meditate with my family (my husband and 7 year old son) is by coloring a mandala coloring book or creating our own mandala. Creating your own mandala can be really fun! 1. Set up the materials on a table: White paper, markers, crayons, pens and pencils. 2. Draw a large circle on the white paper. 3. Create a system: Each person draws one thing or element of the mandala and then it's the other persons turn. 4. Remind yourself to take deep breaths throughout the exercise, remind your loved ones to do so and engage in calming conversation. 5. Do this for about 20 minutes and then enjoy your work of art. Creating a mandala together a couple times a month helps us find a way to connect and relax as a family. Try it! You'll find that it can be very satisfying.